Knitted dresses are back in this season and Soul Cal has created a super cute skater style version for an instant update! 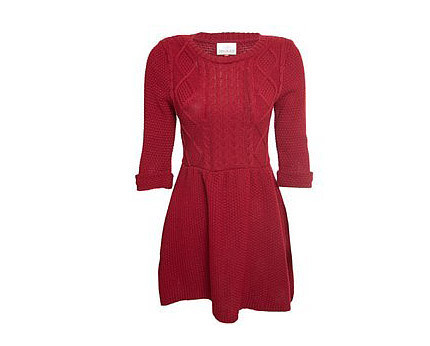 They have combined the classic cable knit in the form a modern skater style dress that is ultra stylish and trendy right now and very flattering to wear! A perfect combination of old and new styles! The Soul Cal knitted dress will help achieve a lovely curved figure by accentuating the waist line and the free flowing mini skirt will conceal lumps and bumps offering stylish yet comfortable to wear garment. This round neck knitted dress has lovely roll up three quarter sleeves for added warmth and comfort offering a laid back edge to your style. Team with super cool knee high boots for an ultra cosy cool style this winter or try dressing up this dress with some trendy studded ankle boots and faux leather jackets, perfect for informal nights out on the town! An extra long stripy jumper with a dipped hem at the back. 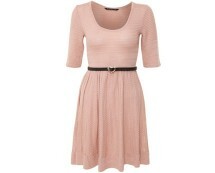 Belt it and wear as a mini dress if you dare! Length approx. 86 cm. 50% acrylic, 50% cotton.